A beloved wife and mother disappears into the sea the night her baby girl is born. The bereft father, a lighthouse keeper, and his son cannot heal their grief and resentments. But when old powers awaken and little Saoirse’s selkie kindred call to her, big brother Ben rises to the occasion. The children embark on a grand adventure and must fight magic with magic to save the spirit world and their own fractured family. Besides looking charming – and wondrously beautiful where appropriate – and featuring a delightful score, the English-language version of this enchanting animated feature boasts the voice talents of Brendan Gleeson as father Conor and giant Mac Lir, Fionnula Flanagan as both the children’s interfering grandmother and the witchy goddess-crone Macha, and winning children David Rawle and Lucy O’Connell as Ben and Saoirse. 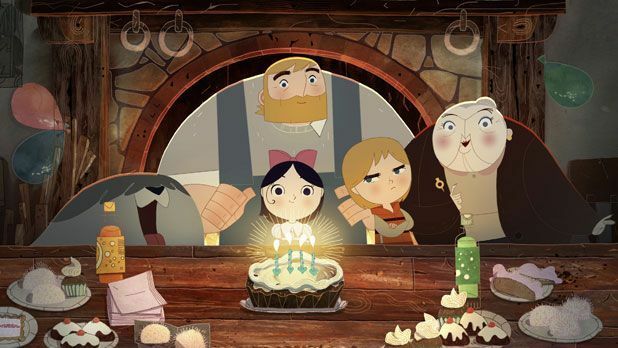 The Kilkenny-based filmmakers (producer Paul Young, director / producer Tomm Moore, head of story / voice director Nora Twomey) who created production company Cartoon Saloon as an outpost of lovingly crafted, hand-drawn animation are clearly giving Hollywood’s animation big boys a run for their money. Like Moore's debut feature The Secret of Kells, Song of the Sea was up for Best Animated Feature at the Academy Awards and is similarly shaped from its director's love of Irish legend, folklore, nature and culture. In this story conceived by Moore and scripted by William Collins, tales of selkies (mysterious shape-shifting creatures that are seal at sea and human on land), deities and fairy folk mingle with the modern world, alongside emotionally accessible themes of family, love and jealousy that even quite young children can respond to. Artistically, too, classical Irish design motifs, the obvious influence of Studio Ghibli, and the contributions of artists from several co-producing European countries make for a beguiling blend of the unfamiliar and culturally specific with the universally appealing.